"Shanthi Lodge'' is situated within the Lochmanor Luxury Lodge & Holiday Home Park, which is located on the outskirts of the picturesque village of Dunning, Perthshire. The Park has been developed in such a way as to provide owners with an array of stunning scenery, and even boasts its own three acre loch with resident swans and wildlife that come and go throughout the seasons. The accommodation is of a high standard throughout, and comprises an open plan lounge, dining area and a modern fitted kitchen. Integrated appliances include a fridge and ,and the stand alone washer/dryer is located in the utility room. There are two bedrooms. The double bedroom has a king size bed with bedside tables, fitted wardrobes, overhead cupboards and a vanity unit. There is a full en-suite bathroom off the main bedroom with full size bath, shower over, sink and W.C. The second bedroom has two single beds with a centre bedside table, fitted wardrobe and overhead cupboards. The main bathroom has a shower, sink and W.C. and is accessed via a "Jack and Jill" door from both the second bedroom and the internal hallway. 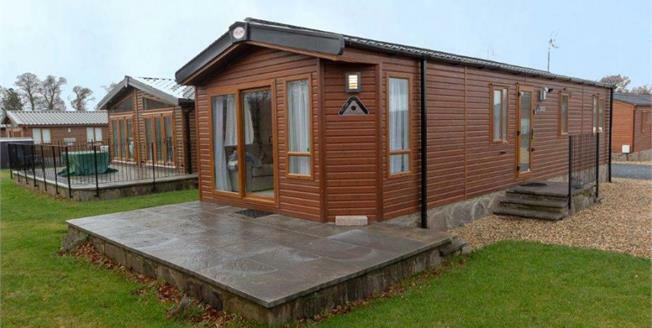 Externally, this two bedroom lodge is completed with a large patio area overlooking the local countryside, with private parking to the side of the Lodge for two vehicles. It is fully double glazed and insulated and has mains gas and electricity connected. The village of Dunning is just a short stroll away with amenities such as the village shop, Inn, Leisure facilities and a Primary school. Further afield, amenities can be found in the nearby towns of Perth and Auchterarder, home of the prestigious Gleneagles Hotel, Equestrian Centre and Championship Golf Course to name but a few. Viewing is highly recommended to appreciate the quality and location of this property. Please note some photographs show the general view of the park.